This is an easy way to cook a whole suckling pig in a pizza oven. Salt cavity well and add onions, carrots and rosemary. Close the opening by sewing the skin if you can. Cover the snout, ears and tail with foil to prevent burning. Roast until the pig is cooked to at least 71°C / 160°F and remove from oven and cover. 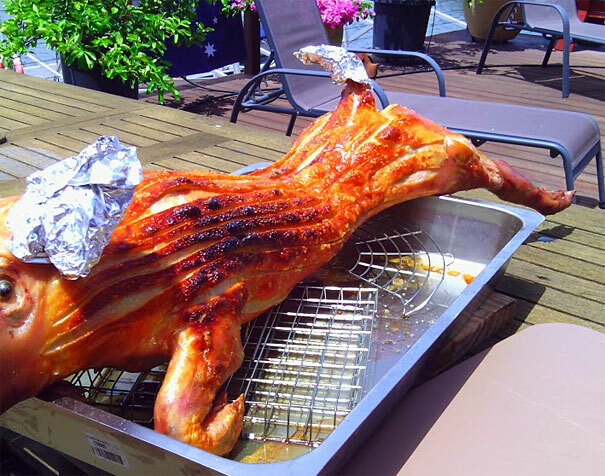 Crank up the oven to 260°C / 500°F and slide the pig back into the oven until the skin is blistered and crackled. It should take no more than 30 minutes.